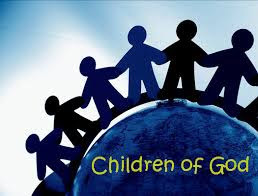 For those who are led by the Spirit of God are the children of God…. We used to live in a Central Texas town which had a large hospital presence. Many of our daughters’ friends had parents who worked there, especially their dads. When we would drive by the hospital with other people’s children in our car invariably we would hear chimes of “that’s my daddy’s hospital!” And, once in a while, an argument would incur about just whose daddy’s hospital it really was. Fortunately for us, when we accept Christ as our Savior there is no need for argument about our Father. God accepts us as His children lovingly and willingly. He has room for us all. Whoever believes in Him and repents of their sins can call Him their Father. While on earth, we have a living breathing personal relationship with Him. When our physical body dies, we join other believers in Heaven as His heirs. All the privileges that come with adoption into His family are ours. Father, thank you for allowing us to become one of your children and heirs by believing in You for salvation.